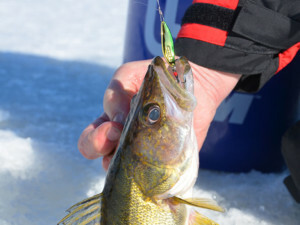 At one of my recent ice fishing seminars, a reader asked for tips on using spoons to catch walleyes during the winter. For starters, I explained, it helps tremendously to have reliable electronics that you know how to operate. You need to be able to mark fish and your lure. Via your electronics, you can observe the response of walleyes to flash, vibration, colors, and jigging action. Drop speed is very important. Finicky fish demand a slow descent. Place a minnow head on one tine of the treble, but try other strategies, too. Experiment with a whole minnow on one tine and maybe a minnow head on the other. (Remember, the head and/or minnow contributes tremendously to the scent factor.) Replace bait every five to 10 minutes. Experiment with various lifts, drops, and pauses, then duplicate the exact movement once you catch a fish. Don’t always expect a thump when a walleye strikes. If you encounter any resistance, set the hook. That’s why a quality, sensitive rod is so important. I’ve found that free-falling spoons banging rocks or a cloud of sediment in a soft bottom can entice strikes. There are days when jigging spoons will not produce, so bring swim lures, jigs, and bobber systems, too.